Career Nurturer provides career counselling and career guidance to students and adults towards selecting their right career field. MBA / PGDM / PGPM are one of the top most sought after post graduation courses in India. 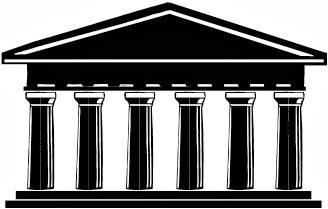 Here is a list of Top B-Schools in India. Note: The list is in alphabetic order, and not according to any ranking. Birla Institute of Technology & Science (BITS), Pilani offers degree courses in Engineering, Sciences, Technology, Pharmacy, Management and Humanities. The campuses are located at Pilani, Goa, Hyderabad and Dubai. 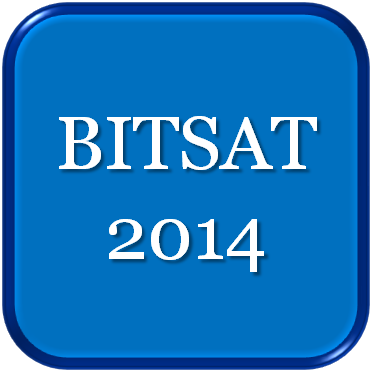 BITSAT is a 3 hour online test for admission to BITS Pilani campuses in Pilani, Goa and Hyderabad. The last date to apply is 15th February 2014 by 5:00pm. For admission to degree programs (except B.Pharm): Student should have passed 12th examination with Physics, Chemistry, and Mathematics and adequate proficiency in English. For admission to B.Pharm: Student should have passed 12th examination with Physics, Chemistry, and Biology and adequate proficiency in English. Students who have taken PCM combination can also apply. Student should have scored aggregate of 75% in PCM or PCB combination; and also have scored atleast 60% in each PCM/B subjects. 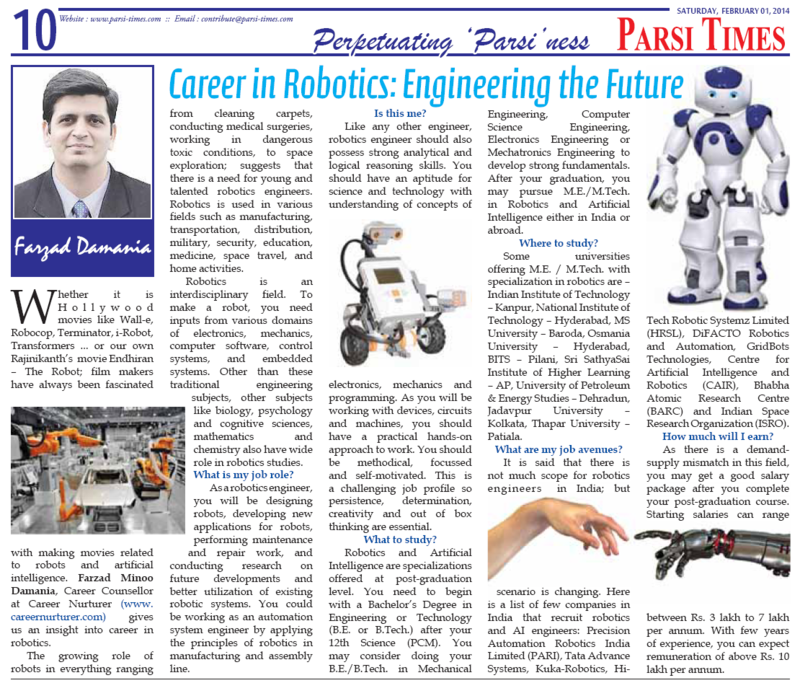 Farzad Minoo Damania – Career Counsellor and Founder – Career Nurturer provides insights into the field of Robotics Engineering. Whether it is Hollywood movies like Wall-e, Robocop, Terminator, i-Robot, Transformers ... or our own Rajinikanth’s movie Endhiran – The Robot; film makers have always been fascinated with making movies related to robots and artificial intelligence. Farzad Minoo Damania, Career Counsellor at Career Nurturer (www.careernurturer.com) gives us an insight into career in robotics. The growing role of robots in everything ranging from cleaning carpets, conducting medical surgeries, working in dangerous toxic conditions, to space exploration; suggests that there is a need for young and talented robotics engineers. Robotics is used in various fields such as manufacturing, transportation, distribution, military, security, education, medicine, space travel, and home activities. Robotics is an interdisciplinary field. To make a robot, you need inputs from various domains of electronics, mechanics, computer software, control systems, and embedded systems. Other than these traditional engineering subjects, other subjects like biology, psychology and cognitive sciences, mathematics and chemistry also have wide role in robotics studies. As a robotics engineer, you will be designing robots, developing new applications for robots, performing maintenance and repair work, and conducting research on future developments and better utilization of existing robotic systems. You could be working as an automation system engineer by applying the principles of robotics in manufacturing and assembly line. Like any other engineer, robotics engineer should also possess strong analytical and logical reasoning skills. You should have an aptitude for science and technology with understanding of concepts of electronics, mechanics and programming. As you will be working with devices, circuits and machines, you should have a practical hands-on approach to work. You should be methodical, focussed and self-motivated. This is a challenging job profile so persistence, determination, creativity and out of box thinking are essential. Robotics and Artificial Intelligence are specializations offered at post-graduation level. You need to begin with a Bachelor’s Degree in Engineering or Technology (B.E. or B.Tech.) after your 12th Science (PCM). You may consider doing your B.E./B.Tech. in Mechanical Engineering, Computer Science Engineering, Electronics Engineering or Mechatronics Engineering to develop strong fundamentals. After your graduation, you may pursue M.E./M.Tech. in Robotics and Artificial Intelligence either in India or abroad. Some universities offering M.E./M.Tech. with specialization in robotics are – Indian Institute of Technology – Kanpur, National Institute of Technology – Hyderabad, MS University – Baroda, Osmania University – Hyderabad, BITS – Pilani, Sri SathyaSai Institute of Higher Learning – AP, University of Petroleum & Energy Studies – Dehradun, Jadavpur University – Kolkata, Thapar University – Patiala. What are my job avenues? It is said that there is not much scope for robotics engineers in India; but scenario is changing. Here is a list of few companies in India that recruit robotics and AI engineers: Precision Automation Robotics India Limited (PARI), Tata Advance Systems, Kuka-Robotics, Hi-Tech Robotic Systemz Limited (HRSL), DiFACTO Robotics and Automation, GridBots Technologies, Centre for Artificial Intelligence and Robotics (CAIR), Bhabha Atomic Research Centre (BARC) and Indian Space Research Organization (ISRO). As there is a demand-supply mismatch in this field, you may get a good salary package after you complete your post-graduation course. Starting salaries can range between 3 lakh to 7 lakh per annum. With few years of experience, you can expect remuneration of above 10 lakh per annum. Farzad Minoo Damania – Career Counsellor and Founder – Career Nurturer provides insights into the career in Forensic Sciences. Do you enjoy reading crime novels on Sherlock Homes and Miss Marple? Or watching crime drama TV shows like CID, Crime Patrol, and CSI? Are you fascinated by the way they solve various crime puzzles from things like hair, autopsies, body tissues, nails, and foot prints? How about you being one of these crime solving forensic experts? Here’s a complete low down on what the career in forensic sciences is actually like. Forensic Science is the application of principles of science and technology for investigation of crime. As a forensic scientist you will either investigate crimes by collecting and analysing physical evidence found at the crime site; or perform laboratory analysis using scientific and technical methods to identify and classify evidence. You will be meeting various experts (fingerprint, handwriting, medical, chemical, ballistics) to discuss and interpret your findings. You might be reconstructing the entire crime scene to figure out how pieces of evidence are related. You will then write and present your findings, and if required testify in trails and hearings in court. Since you are playing an investigative role, you need to have good observation skills, an eye for minute details, deep thinking, intellectual curiosity, strong problem solving ability, and aptitude for scientific analysis. You will be working either in a laboratory or at the crime scene – thus you should be willing to work odd and long hours. You should possess good team spirit to work closely with other experts from fields of psychology, social work, law, sociology and statistics. Mental strength, handling emotional distress, dedication and personal integrity are some other traits necessary for working in this field. You need to be emotionally mature and should have a strong stomach as some crime scenes can be very unpleasant, also giving verification in court can be stressful. So this career is not for the faint hearted. There are several career paths available for pursuing a career in forensic sciences. If you want to be a forensic scientist then you may consider B.Sc. in Forensic Sciences or Physical or Biological Sciences and then pursue M.Sc. in Forensic Sciences. To become a forensic pathologist, you first pursue your M.B.B.S. and then follow up with an M.D. in Forensic Medicine. Those who are interested in pursuing criminology as a career option, can pursue graduation in arts or science, and then pursue M.A. /M.Sc. in criminology. Entrance exams may be applicable for admission to the graduate and post-graduate courses. Some of the universities offering courses in forensic sciences and criminology are Amity University – Noida, Dr. Hari Singh Gour University – Sagar, Gujarat Forensic Sciences University – Gandhinagar, LNJN National Institute of Criminology & Forensic Science – Delhi, Punjabi University – Patiala, University of Mysore – Mysore, and Panjab University – Chandigarh. Depending on your coursework, you may work in one of the following areas. Crime scene investigation, forensic psychology, forensic serology, forensic pathology (post-mortem), forensic medicine, forensic anthropology, handwriting analysis, forensic toxicology, and forensic odontology (dentistry), forensic reconstruction, and crime laboratory analysis are some of the job roles in this field. Where can you find job? Government Agencies such as Central Bureau of Investigation, Forensic Laboratories, Documentation Examination Laboratories, National Human Rights Commission, Research and Analysis Wing, Intelligence Bureau, Narcotics Department, Forest and Wildlife Departments, and Police Departments are the main recruiters in this field. You may also find employment in private detective agencies, NGOs, juvenile shelters, banks and insurance firms, judiciary and courts, rehabilitation centres, and universities.